Lead Corrosion: The most common example of lead corrosion is a white substance that forms over the surface of the lead. This substance is called “lead carbonate”. It is important to recognize that the formed lead carbonate is not a substance clinging to the surface lead; it is the surface of the lead transformed to powder. This product of corrosion is indicative of a more harmful type of corrosion and if the micro-environment that encourages this corrosion is not altered, the lead matrix will ultimately fail. This condition is normally caused when the exterior protective glazing covering the stained glass windows is not vented for air circulation. The air is trapped in the inner space between the stained glass and the protective glazing causing condensation, which attacks the lead matrix as well as the wood surrounding, creating a very hostile environment for the stained glass windows and the wood structure. The only way to correct this is to vent the protective glazing, creating airflow, and allowing all of the acetic acids and moisture to escape into the atmosphere. This is not only crucial for the lead matrix in the stained glass windows, but also for the wood frame. When evaluating if a stained glass window needs to be completely releaded, one must look at a variety of things as the window is closely and properly inspected. At Serpentino, we disagree with the all too familiar statement and one that some use as a scare tactic and a way to ensure work for their large staff, that a stained glass window must be completely releaded after the magic “100 year” mark of its life. The first important factor is that the person inspecting the window has sufficient knowledge and actual hands on experience to recognize the various issues associated with lead deterioration and the overall condition of a window. Following is a list of issues and situations that indicate when a stained and leaded glass window should be completely releaded. 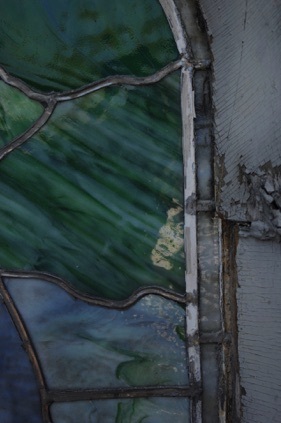 The two photographs on the left show a stained glass window exhibiting signs of metal fatigue. 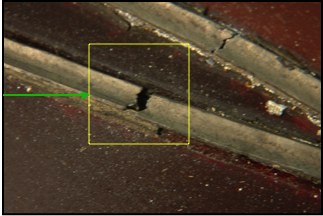 Metal fatigue is indicated by irregular cracking (see highlighted areas in the photographs) of the lead came. When it is in an advanced stage, cracking can be seen in the leads away from the solder joints. It is important to recognize and understand that when the lead reaches this stage, it cannot be solved by cleaning and soldering over the joint or crack. 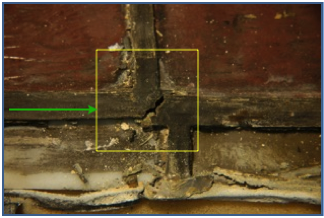 When a window exhibits these signs, the client should be advised to monitor the window or windows and see if more cracks in the lead develop. If a window shows extensive cracking of the leads, especially away from the solder joints, it should be of great concern and complete releading at this time may be necessary and recommended.